There are no truly no words to describe how amazing DJ Joey made our night! Our guests are STILL talking about how much fun they had! He really made the evening flow well and was very attentive to every little detail. He had everyone up and dancing, even our grandparents who danced so much they woke up sore the next morning! LOL! In truth, he went above and beyond the traditional role of a DJ. He approached us several times throughout the night making sure we were ok and having fun, and that everything was how we had envisioned. He had conversations with multiple family members and happily played any requests that guests had. His overall demeanor and personality was so pleasant and upbeat! He was there early in the day setting up and testing every little detail to make sure everything rolled smoothly. His set up was very professional in appearance, and very up to date with the latest technology. His song bank was RIDICULOUS! Believe me, if he doesn't have it already-he'll get it for you in the snap of a finger! He had two lengthy conversations with us, one a few months before the wedding when we booked, and one a few days before the wedding. He reviewed everything with us in detail and made it his personal mission to give us the night of our dreams! As an added bonus, he sent us almost 75 pictures the week after the wedding. It was so cool to have a different perspective of pictures from his point of view. DJ Joey gets beyond 10/10! Our night would not have been the same without him. I would HIGHLY recommend his service if you are looking for a stress-free, fun night! THANKS JOEY! WE WILL NEVER FORGET HOW SPECIAL YOU MADE THIS DAY! We absolutely loved DJ Joey from the very beginning! He called us about a week in advance and went over every detail with us and made really helpful suggestions. He stuck to the genres we liked as well as our 'do not play' list. Everyone at the wedding we spoke with said how good the DJ was, and he fulfilled all of our expectations. I would highly recommend DJ Joey to others!! An added bonus was that he took pictures on his own a sent them to us, which actually was a huge blessing because our photographer was hired up until the dancing began. 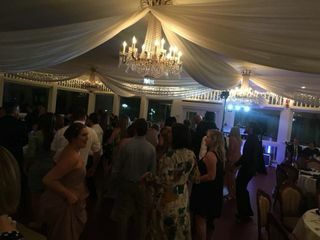 So we still got some pictures of the dancing, thanks to the DJ! Thanks Jamie, reviews like yours means so much to us. We will go as far as it takes to make sure that you and your husband are the most satisfied on your most special day. Thanks again for letting us be part of your wedding! Joey DeSena made it HAPPEN! Joey went above and beyond to make our wedding ceremony and reception unique to us and fun for guests. We received so many compliments! He accommodated ALL of our less-than-mainstream musical requests while also including selections that suited our tastes AND the theme of the event perfectly. The energy was consistent and spirited, last-minute requests were handled flawlessly and we were so thrilled with the experience he gave us. He also provided lighting and sound equipment in coordination with our venue that made the day effortless for us. For such a reasonable price you can't go wrong. Thank you Joey! Hi Ellen & Christian, I'm so glad to know that you had a great time and enjoyed your day so much. What a great wedding! Thank you so much taking the time to write such a wonderful review! I can't tell you how much it means to us. You made my day! We had a small wedding, only about 45 guests but Joey made sure our day was everything we wanted it to be. He was always responsive to emails and understanding of any changes we made. He made sure to move at a pace we wanted while still getting everything done that we wanted at our reception. I would recommend Joey to anyone looking for an affordable dj that will go above and beyond for your big day. Hi Jess & Danny! Great review, what a great personal touch planning your wedding the way you did! Not the same cliche, so much fun, thanks for letting us be part of your day! DJ Joey D was the BEST! We are so so happy he was there for our wedding day! His services are unmatched. Immediately upon booking he called to confirm with us, he was very flexible when we had to change towns for our wedding and he was always so responsive! He made picking special songs super easy, provided a rough timeline to help us out, and called the week of the wedding to make sure everything was absolutely perfect. 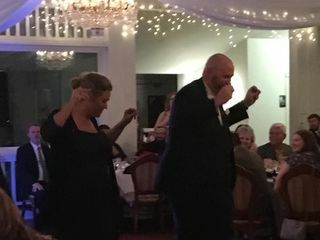 He was able to mash-up two songs for the father/daughter dance so I was able to surprise my dad with his favorite song and Joey was totally willing to help out! He really paid attention to the crowd and played songs that kept them on the dance floor all night. He even provided glow sticks, uplighting, and a custom floor monogram in our package, all were a hit with our crowd! Something we will definitely treasure are all of the photos he took for us! After the wedding he sent us an email with photos he had taken from our ceremony and all throughout the night, that was so special and totally unexpected! Definitely pictures we will cherish forever! We are so happy he was a part of our day!!! Thanks Jamie, reviews like yours means so much to us. We strive to make weddings such as yours a huge success! We will go as far as it takes to make sure you and your guest have the best time possible. I had a great time and it will be one that i will remember! DJ Joey was amazing! From our first communication all the way through the wedding reception he exceeded our expectations! Our reception was perfect because of him! DJ Joey was Outstanding! He was very responsive to all emails, was very organized and made sure he understood exactly what we wanted for our daughter's wedding! He arrived plenty early to make sure everything was set up perfectly and stayed well after the event to break down. He kept the dance floor full all night long and everyone had a Great Time! All this at a very affordable price! I would give him 100 stars if I could!!! Thank you DJ Joey!!! DJ Joey was amazing for our ceremony and reception! He provided us with an example timeline that made it easy to fill out as well as being flexible to playing our many different song choices! He was available always for any questions we had! His professionalism and expertise in his line of work helped our event run smoothly, especially since we didn’t have a wedding coordinator!! Thank you so much DJ Joey for also inserting my recording at the last minute and making sure our night was exactly how we wanted it!! Thank you Mindi for the wonderful review. Your wedding day turned out spectacular! Right from the ceremony to the reception. The dancing and the interaction couldn't have been better. I wish you and Alex the very best and thank you for letting me be part of your special day! Thank you Joey for being so professional and excellent for our event! From our initial conversation to the day of the event I felt at ease dealing with Joey, he really listened to all of our requests and accommodated them. He pays attention to detail, responds promptly always, and was the perfect DJ for our event. DJ Joey was fantastic to work with every step of the way. He contacted us several times along the way to see how we were doing and if we had changed our mind about anything. He set up a music booth at the ceremony (outside) and one inside the venue for reception. All music transitions and pronunciations of names were perfect. He did review with us a week prior to verify every final detail. All of our guests never stopped dancing the entire night and complimented our decision of having him celebrate the occasion. We also got great pictures from him shortly after the wedding as an unexpected bonus! Joey from Special Day Entertainment was AMAZING to work with. He was so flexible and responsive and a true professional. The guests did nothing but compliment him and he kept everyone dancing all night. He even sent pictures of the night we may have not gotten otherwise. Fantastic work. Thank you so much for the wonderful review, It was an honor to be part of your special day! Thanks again! Our whole experience was excellent. I honestly have no complaints and recommend highly Special Day Entertainment for anyone having an event. Thank you Nicole & Peter, It was such a beautiful wedding and a great time. Glad to be a part of your special day! Our wedding was at The White Room. Joey was awesome. I could not have asked for a better DJ. His personality was super!! The music was great. Loved the purple up lighting. Joey did a bang up job. I will definitely recommend him to my friends. Thanks so much for the wonderful review! It was such a magical night. I see that you and Chris are blessed. Take care Sheila! DJ Joey did amazing! He was so helpful throughout the planning process—he responded back to any question within a few hours and shared so much guidance. His set up was first class and his music had our dance floor packed the entire night! He was prompt, knowledgeable, and friendly. We highly recommend him for your wedding—you will not be disappointed! Thank you so much for wonderful review Stefanie, your wedding was so much fun throughout the evening and it was our pleasure to be a part of. Congratulations again! fantastic experience with DJ Joey! 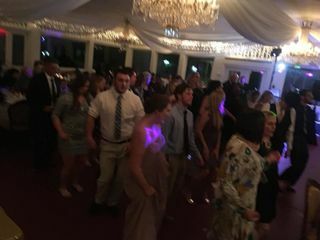 he was very organized & detailed, had a professional set up, was extremely flexible and easy going, everyone was up and dancing and having a great time! Also very cost efficient and not just a DJ that played music, he was a "wedding DJ" that used a microphone when needed too to keep wedding activities going smoothly. He went even more above and beyond by sending us some fantastic photos he took! SOOO HAPPY that we found Joey and Special Day Entertainment! Joey made our daughter's wedding day ABSOLUTELY PERFECT. Joey made the ceremony and reception absolutely perfect - everything was so smooth. The music was incredible - people were up and dancing immediately and had such a great time! Joey's equipment and set up looked very high tech and professional. He created a lighted monogram for the dance floor that just looked so fabulous!!! Joey always responded immediately to any questions I had. He even took the time to create a mix for our daughter's special father/daughter dance. The night couldn't have gone any better, thanks to Special Day and Joey. I have to say one more thing -- Joey recognized the service men and women that were our guests that night and that touched me in such a big way! He was just FANTASTIC and I will always call upon his company when I need DJ services. It just doesn't get any better than Special Day. Thank you so much, Joey!! Thank you Connie for the great review! What a picture perfect night. Everything went fabulous and everyone had such a fun time. I wish many years of good luck to the bride and groom! Special day entertainment did an excellent job on our wedding. Not only was he punctual and professional, but kind as well. There were no notable hiccups in our day with Joey, and his set up (which he had many to choose from) fit perfectly with our decor. We would absolutely use this company again in the future if needed and recommend them to anyone. Wonderful review! Thanks so much. We listen very hard to much sure you have the wedding you envisioned! Your day in Old Town couldn't have been better. Such a picture perfect day for a wedding! Thank you again! From start to finish, Joey was super responsive and helpful, especially because we were out of state. I would recommend him to anyone! He made sure the timeline was followed to our requests, and kept us informed all night. He did great at music selection and requests. He also took some pictures for us and shared them too. Thank you Joey for making our day extra special. Dj Joey was very professional and very nice. He is so organized from beginning to end. Absolutely amazing to work with, answered any questions. Would recommend him to anyone. Thank you Pat for the great review! You did an amazing job to make Kerrie & Reggie's day a dream come true! So glad I was apart of their day! Joey was a wonderful DJ and MC. We were picky about our music choices, and he nailed it! Of the 110 wedding guests, all were on the dance floor all night long - both the young crowd and the older crowd. Everybody is still talking about how awesome the music was. Thank you Joey for making our wedding a memorable one!! We HIGHLY recommend Joey's services. His prices are the BEST in town, he is responsive, he helped out with my officiant needing a microphone and speaker (even though I hired him for cocktail hour/reception only), he provided great uplighting, he kept the night moving along, he provided great MC services - the list goes on and on! Hi Katie & Chris, Thanks so much for the suburb review! Everything was beautiful at the Fountain of Youth. The celebration was second to none! Your guest was a blast! I also had a great time. The very best to you! Joey was an AMAZING DJ!! He was so responsive to emails/calls/text messages. He met with us prior to our wedding to discuss any must haves, etc. and he was so accommodating. He was great with our guests and really kept the crowd going. Everyone loved him! He made day-of just adjustments for us when we decided to switch our main song, he let us add songs/requests, and really guided us through the whole process without having a wedding planner. Hands down would recommend him to anyone! Hi Brianna & Michael, Thanks so much for the wonder review! It was a picture perfect day for your wedding and everything turned out like you wanted. The energy from your guest was the tops and I also had a great time. Thanks again and the very best to the both of you. Joey did an excellent job DJ'ing and MC'ing my ceremony and reception. Everything followed through like clockwork, and all my guests were impressed. I feel like we got every cent of what we paid for, and then some. Thank you, Joey for making my wedding night memorable and night to never forget, and thank you for taking pictures! Joey was absolutely amazing at our wedding at the White Room in St Augustine. My husband is from France and requested many songs that many other DJ's would not research, however Joey included all the songs we had asked for. 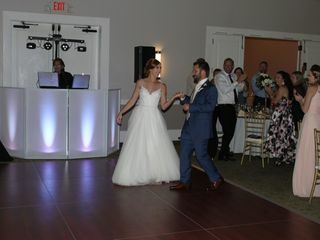 His DJ check-list made our wedding easy and simple, and his music choices and timing were spot on! Definitely recommend! Hi Matthew, Thank you fro the great review! Your day turned out to be so beautiful and your guests were rockin the place. I had a great time and it was a pleasure & honor to be part of your day!